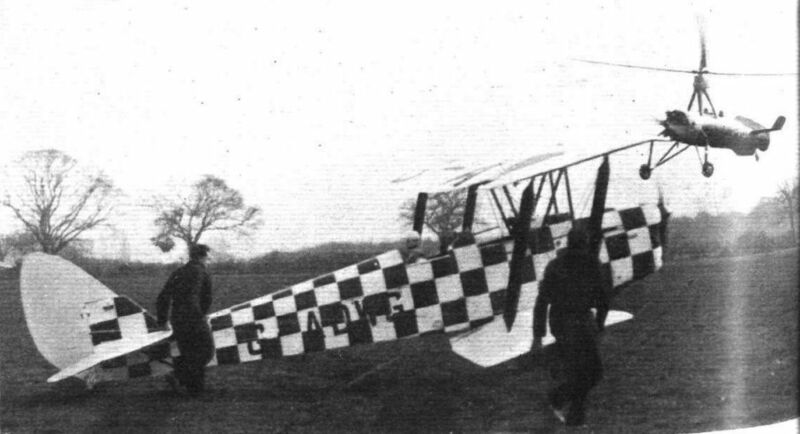 The Hughes monoplane, seen here with its 1,000 h.p. Twin Wasp Junior uncowled, holds the world's landplane speed record with 352 m.p.h. The Hawk Trainer, which differs only in detail from the standard Major. Major Thornton is a keen private owner who uses his machine for touring at home and abroad. A Liverpool ship-owner by profession, he has no patience with narrow-minded nationalism, especially where it affects air travel. In the snapshot here, he is seen with Mrs. Thornton at last year's Magyar Pilota Picnic, to which he flew in his Hawk Major. The Falcon Six - actually the King's Cup winner being flown by Flt. Lt. Rose himself. 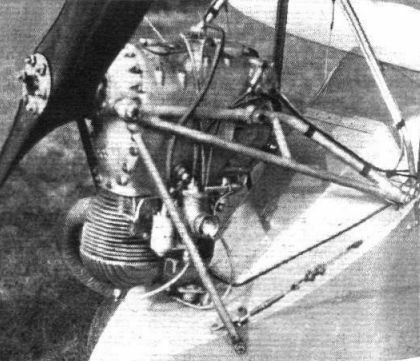 The in-line air-cooled engine permits a clean cowling installation, as typified on the Miles Hawcon (D. H. Gipsy Six) in the Flight photograph. 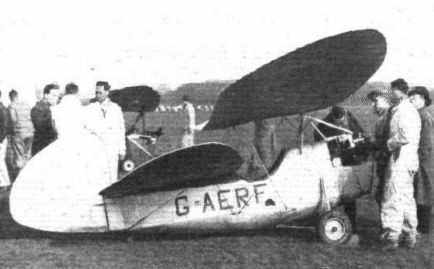 In its three-seater form the pilot of the Miles Falcon - in this case the Gipsy Six model - is seated centrally. 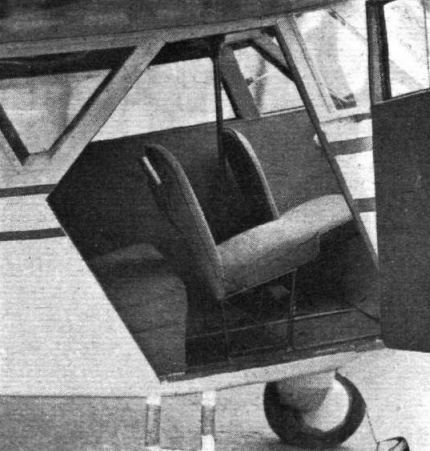 As a four-seater the third passenger sits beside the pilot, who has the control column on his right. The arrangements for passengers and luggage are shown in the diagram. A Farman biplane of the type acquired by Mr. R. G. J. Nash. MORE DRAGONS' TEETH: Austria's air force, forbidden under treaties, was inspected by Herr Schussnigg during the spring parade in Vienna. 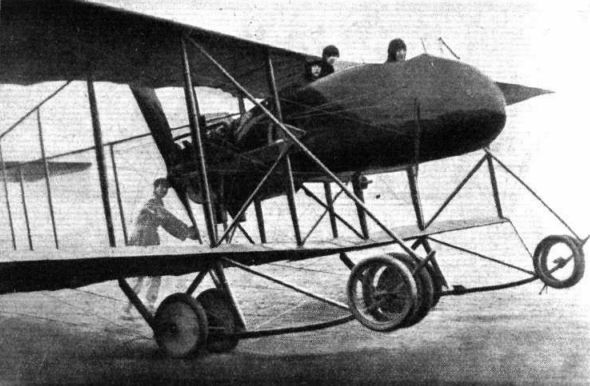 The machines seen here are Fiats of the improved C.R.20 type. The A.W. XVI (Panther) of a few years ago; it had an inner flange cowl in addition to its Townend ring. This arrangement is not now standard on the two-row Siddeleys. 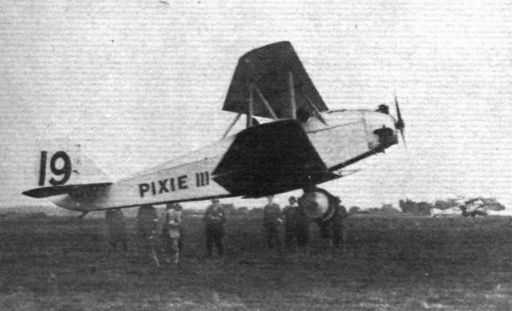 TAKE-OFF AND PULL-UP TESTS AT LYMPNE: 5, The Parnall "Pixie IIIa" in the pull-up test. 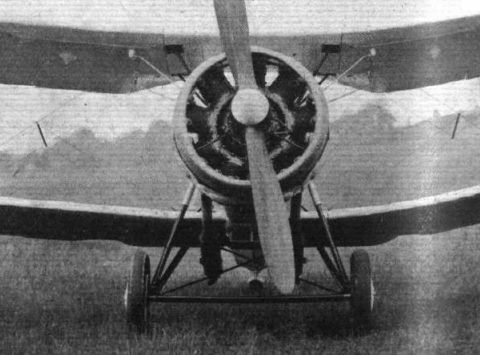 Much pioneer work has been done in the U.S.A. with the enclosing of geared and supercharged engines in long-chord cowlings. 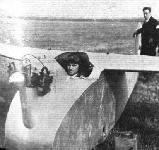 This view shows the mounting of one of the 550 h.p. 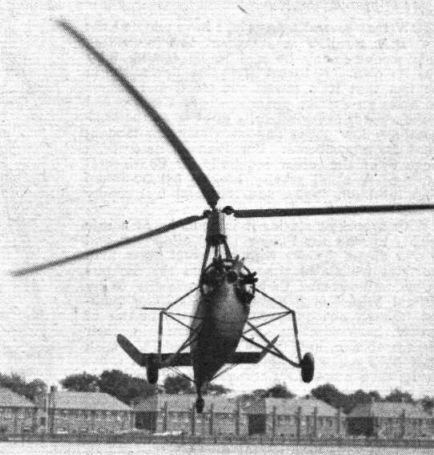 Wasps in a Boeing 247-D.
Unrehearsed item: The elderly C.19 Autogiro which visited the Rally lives up to its registration letters. 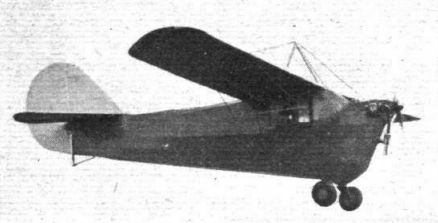 The Curtiss Condor (two Cyclones) is a particularly quiet transport. 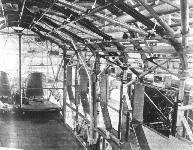 This view shows some of the insulating measures - indicated by arrows - which have been taken in its Sperry-proofed cabin. 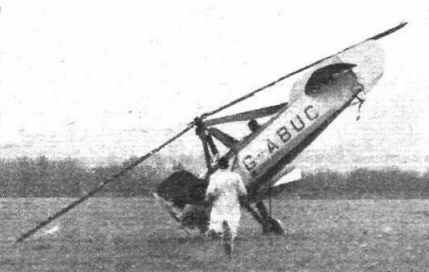 An unusual view of a C.30 Autogiro obtained at the moment when it was sinking vertically on to the ground at Hanworth. 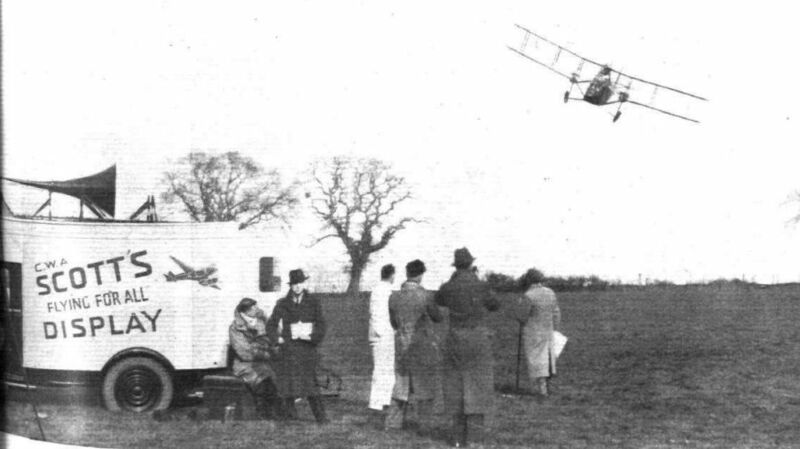 Going On and Coming Off: Mrs. Crossley taxies out in her chequered Tiger Moth, and Mr. Ashley sets down the Autogiro before the crowd. The nose of the Blackburn "Shark" "Tiger"-engined T.S.R. 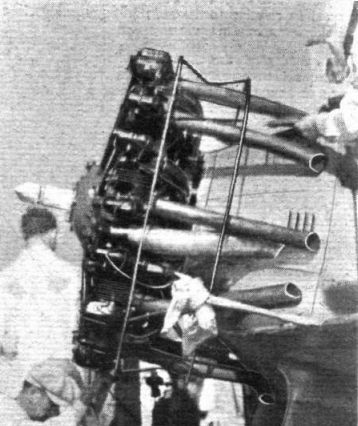 biplane, showing how the 18-inch torpedo is carried and how the 760 h.p. 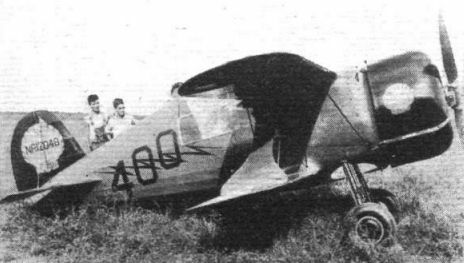 14-cylinder Tiger is fitted with the long-chord Siddeley cowling. TRAINING BOAT PILOTS: All pilots who are posted to a flying boat squadron are first sent for a course with the Seaplane Training Squadron at Calshot. The Saro Cloud is used for preliminary training. 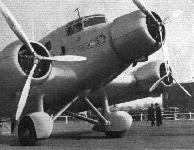 CAPITAL: "London" is the type-name of the Saunders-Roe general purpose flying boat now in production for the R.A.F. This picture shows the first machine "off the line" on the new Saro slipway at Cowes. 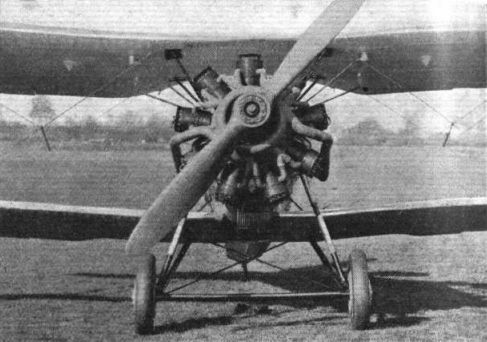 The engines of the "London" are 690 h.p. Bristol Pegasus III moderately supercharged radials: the top speed is 136 m.p.h. 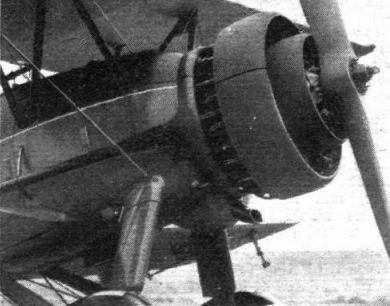 Extreme performance was not aimed at, but rather seaworthiness coupled with versatility. It is understood that this particular machine is likely to visit the Stockholm Show. 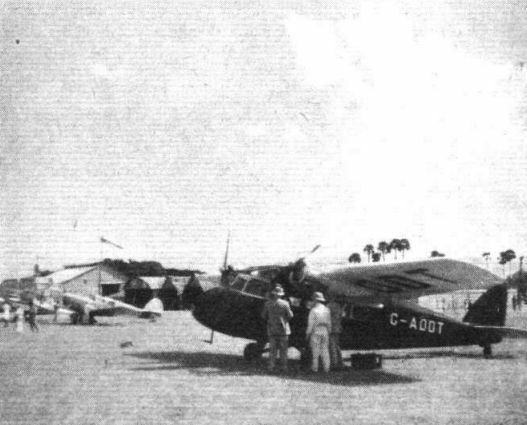 NO TENDERFOOT: The Noorduyn Norseman is a light transport particularly suited to the Canadian market. 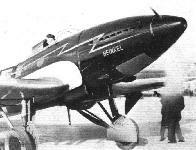 Its designer, Mr. R. B. C. Noorduyn, has worked, at various periods, with Fokker (America), Bellanca and Pitcairn. With one of the new 420 h.p. Wright Whirlwinds it does 160 m.p.h. 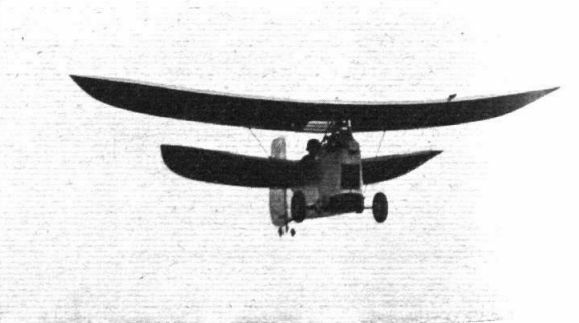 as a landplane with a 1,950-lb. payload. 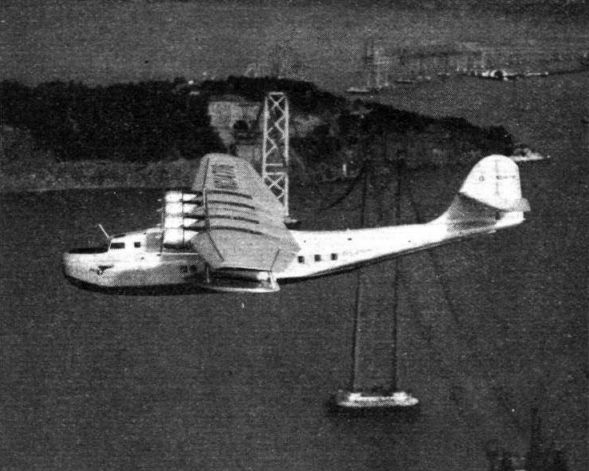 The seaplane version does 146 m.p.h. while on skis the machine is capable of 148 m.p.h. 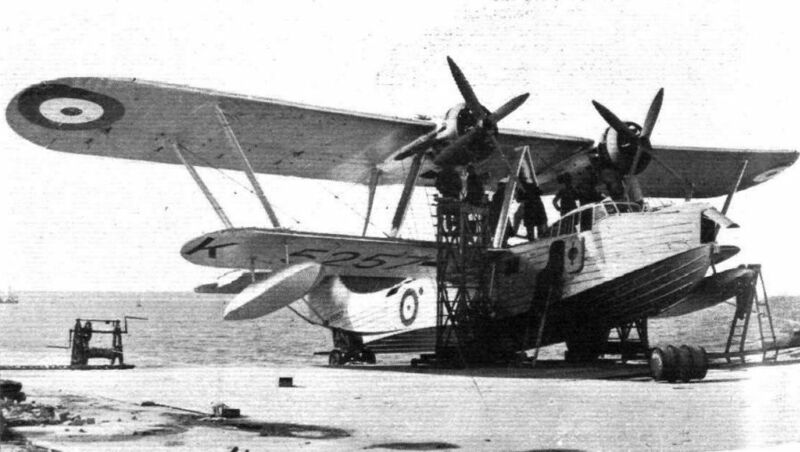 FOR GENERAL PURPOSES AT SEA: A production-type Fairey Swordfish torpedo spotter reconnaisance shipplane (690 h.p. Bristol Pegasus III) during tests over Hayes. 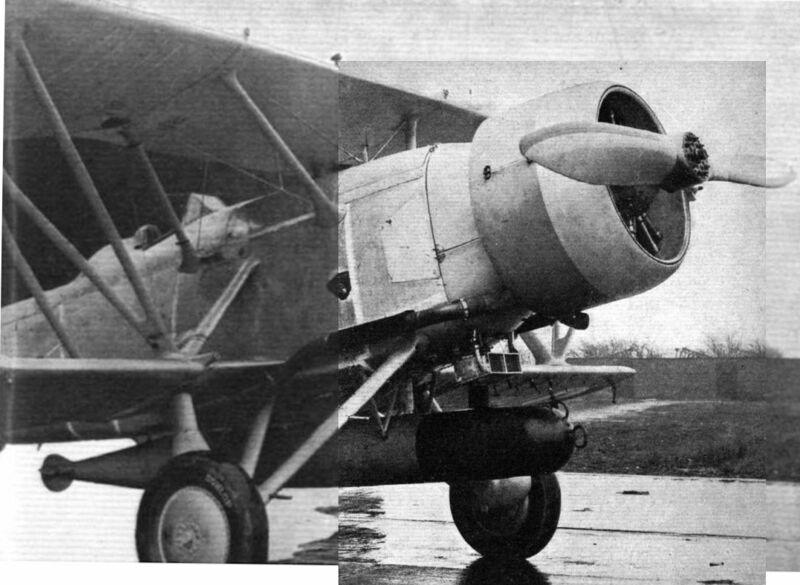 The Swordfish performs the duties of both the torpedo bomber and fleet spotter types. OUTPUT: "It can almost be said that we have reached a position where the primary structure is of secondary importance from the point of view of the man-hours required to build it. 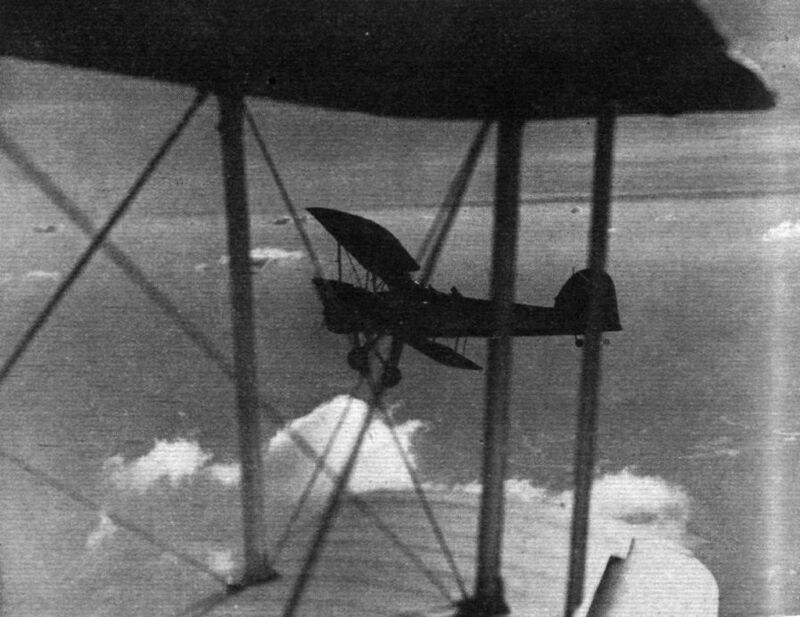 It is the installation of equipment which runs away with the time ..." Point is lent to this quotation from a recent Flight leader by this picture of a Fairey Swordfish having its equipment installed. 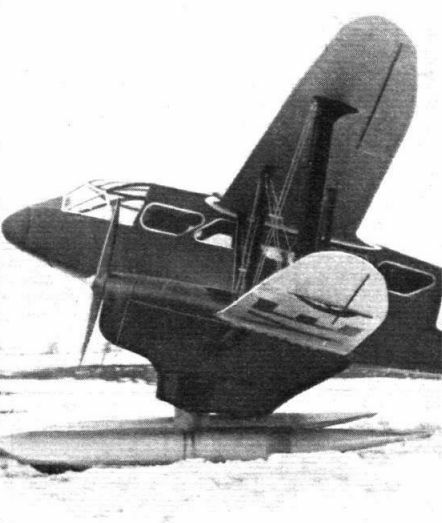 STREAMLINE SKIS: The first D.H. Rapide to be fitted with skis in Canada. 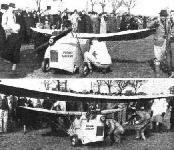 These are, it is believed, the first streamline skis to be fitted to a transport machine and have positive pitching movements about the axle. In these three views the main features of a modern baffled installation are readily seen. The first two show the specially shaped "shoulder" which conducts the cooling air out of the "gills"; in the second the inter-cylinder baffles are visible, and the third shows the complete installation. The nose portion forms the exhaust ring. Actually this installation is of one of the 690 h.p. 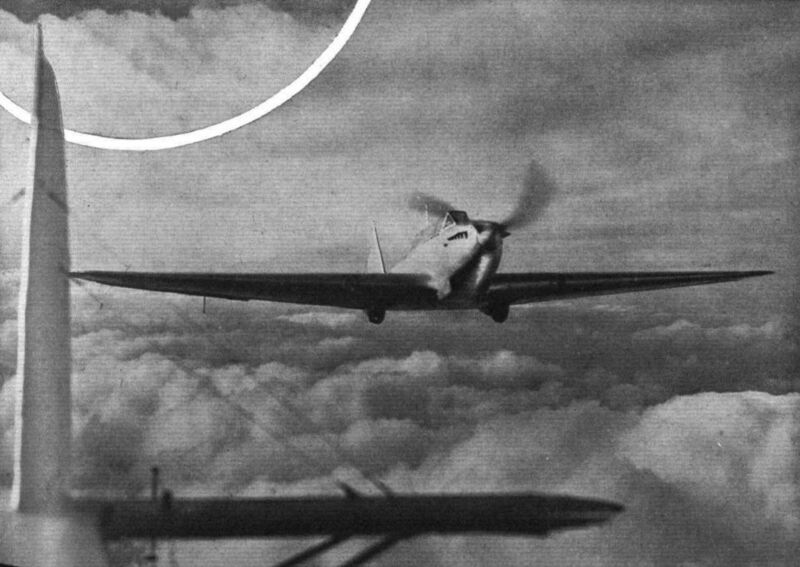 Bristol Pegasus III's in a Douglas D.C.2. An interior view of the passengers' cabin of the Douglas. D.C.1 "Transport." 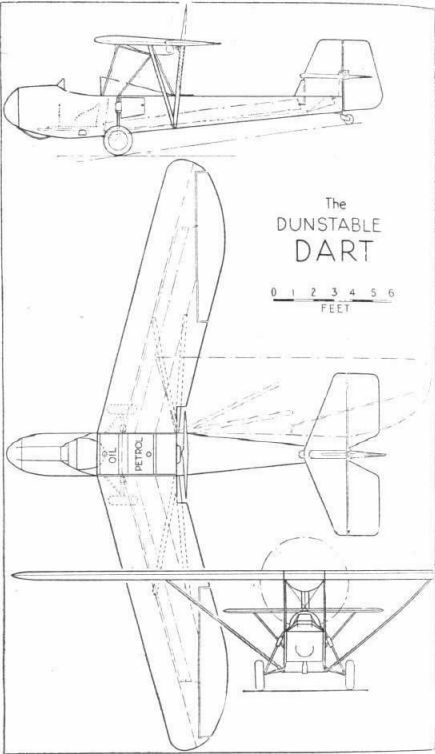 A diagramatic representation of the noise level distribution in the cabin of the Douglas D.C.1 cruising at 75-80 per cent full power and carrying twelve passengers but no mail nor baggage. The lines of Coupe Deutsch racing Caudrons have been preserved to a noticeable extent in the new Goeland light transport. The Heinkel He.70a, which has been bought by Rolls Royce Ltd. as a flying engine test bed, photographed last week at Croydon. 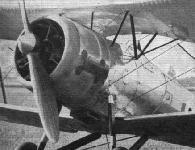 At present it is fitted with the 600/640 h.p. 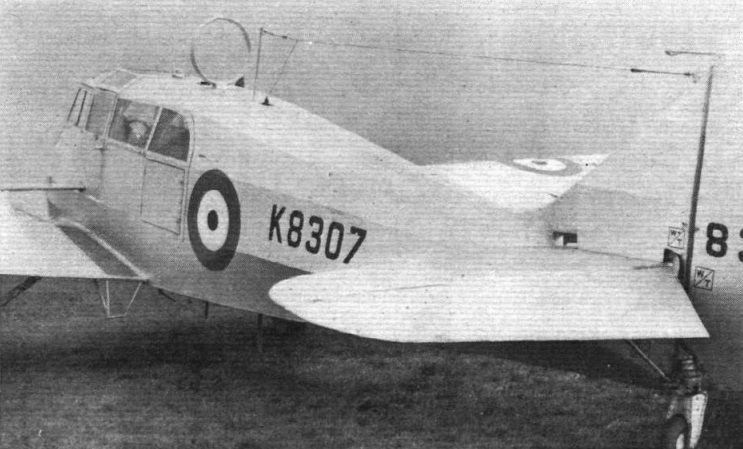 Kestrel V - already a standard unit in the R.A.F. Later this will give place to more "hush hush" types. The excellent form of the nose shows up to advantage in this picture. THE ROLLS-HEINKEL: Another view of the He 70a, with Kestrel V engine, which visited Croydon last week on its way to Hucknall from Germany. 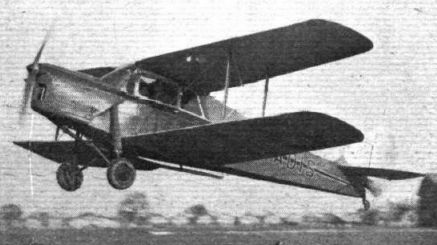 In its new form the Hornet Moth has a remarkably short take-off and climbs steeply as soon as it is clear of the ground. 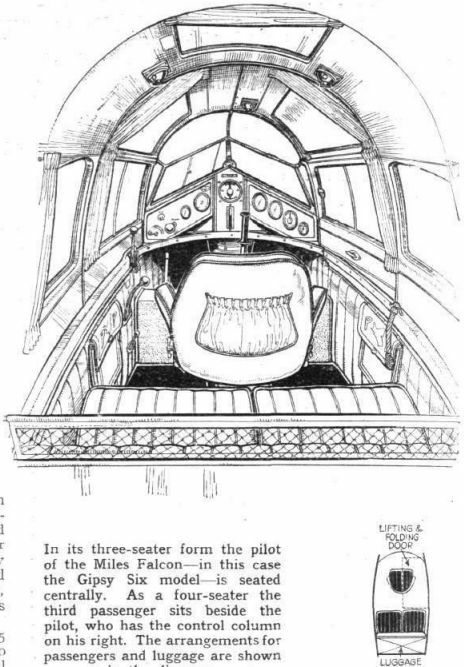 As may be gathered, both pilot and passenger have an excellent view in the forward hemisphere as well as through the roof light. 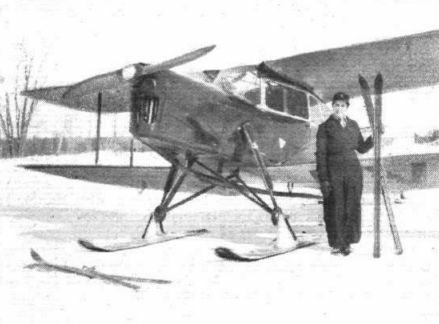 THE GIRL OF THE LIMBERLOST: The first photograph of a D.H. Hornet Moth on skis. It was taken at Limberlost, a popular winter sports resort north of Toronto, and with the machine is Mrs. Lee Murray, wife of Mr. Lee Murray, who manages the Canadian De Havilland Company. LORD LONDONDERRY, during his tenure of office as Air Minister, was a keen pupil and private owner. 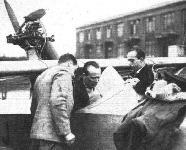 He retains his interest and is seen above about to try a D.H. Hornet Moth at Hatfield in company with Mr. Peter de Havilland. 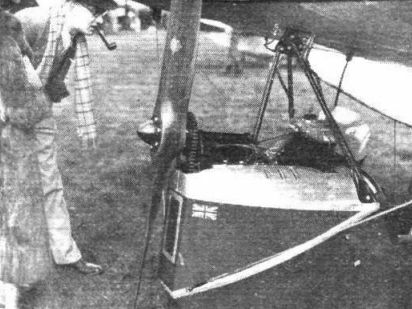 The machine is actually the London Aeroplane Club's latest latest acquisition, and not "ADIS." 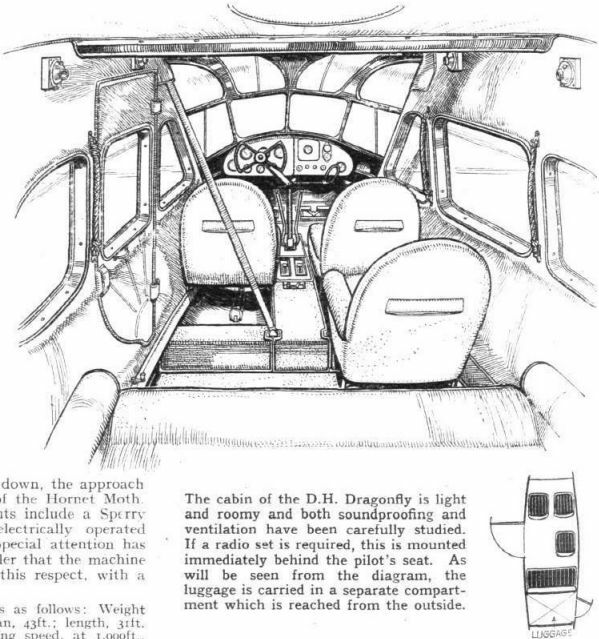 The cabin of the D.H. Dragonfly is light and roomy and both soundproofing and ventilation have been carefully studied. 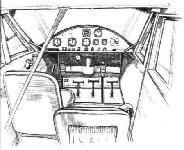 If a radio set is required, this is mounted immediately behind the pilot's seat. As will be seen from the diagram, the luggage is carried in a separate compartment which is reached from the outside. 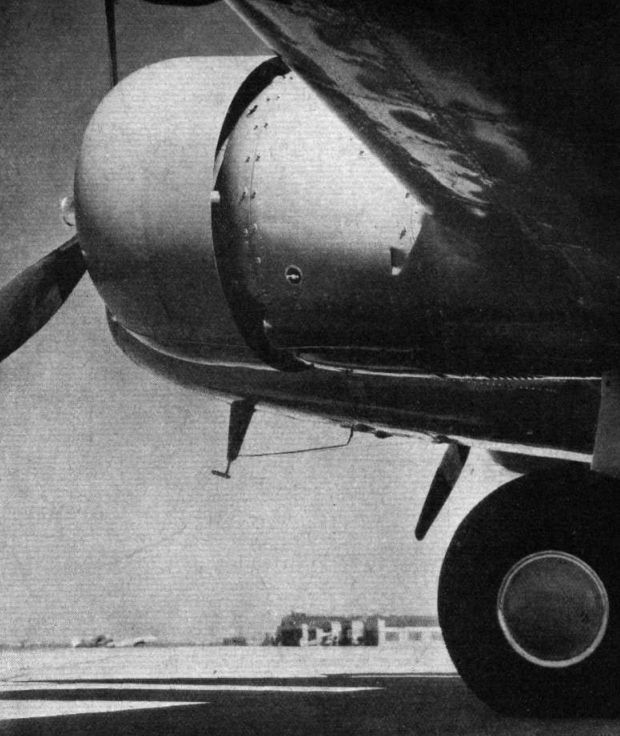 The De Luxe model is shown in the air. 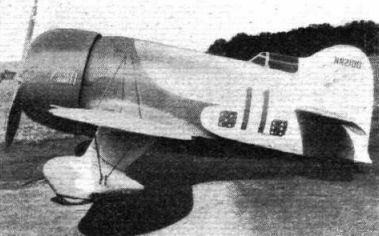 The plan form of the S.T.25 wing is admirably shown in the flying picture. 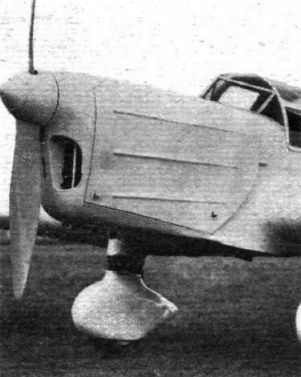 The position of the adjustable landing light in the nose can be seen in the view. The picture gives a good impression of the wide field of view available for both pilot and passengers. 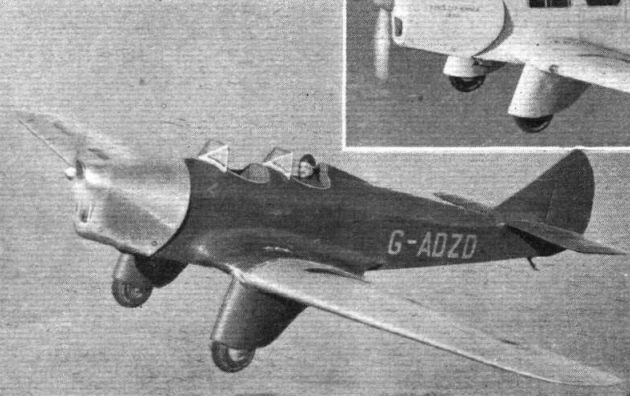 FOR BLIND APPROACHES: One of two Monospar S.T.25s which have been equipped for the wireless flight at Farnborough. This machine has full dual control, with a hood for one pilot, Lear direction-finding equipment, Sperry Horizon and directional gyro, a Reid and Sigrist turn indicator, a Kollsman sensitive altimeter and Smith rate of climb indicator. 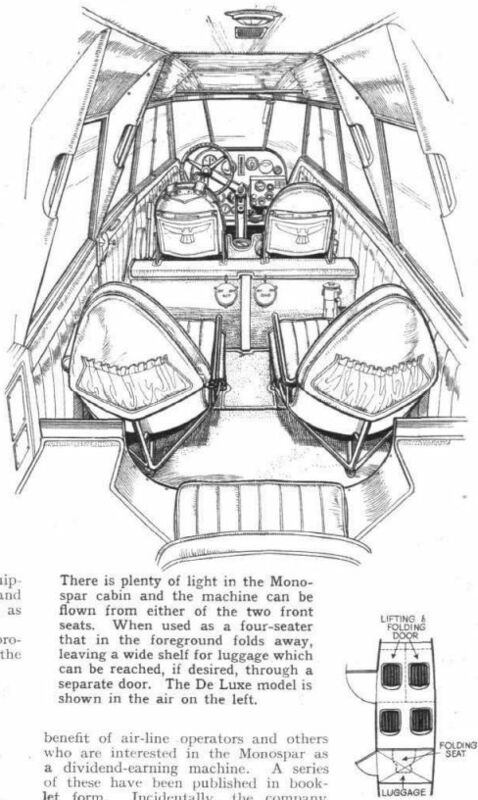 There is plenty of light in the Monospar cabin and the machine can be flown from either of the two front seats. When used as a four-seater that in the foreground folds away, leaving a wide shelf for luggage which can be reached, if desired, through a separate door. 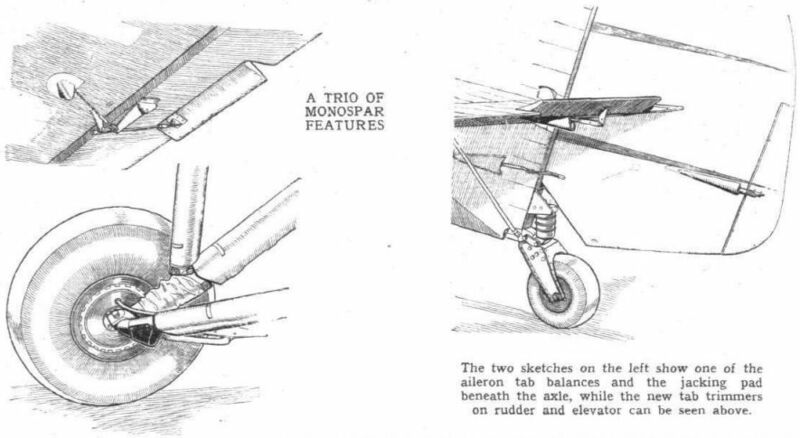 The two sketches on the left show one of the aileron tab balances and the jacking pad beneath the axle, while the new tab trimmers on rudder and elevator can be seen above. 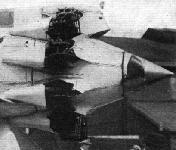 A Moth and Hawker Demons of the R.A.A.F. 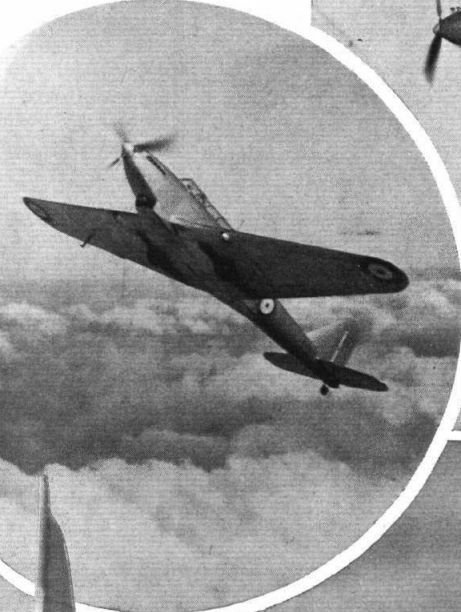 The Australian Demons are equipped for bombing as well as for fighting, carry army co-operation gear such as message hooks, and use the Kestrel V engine. 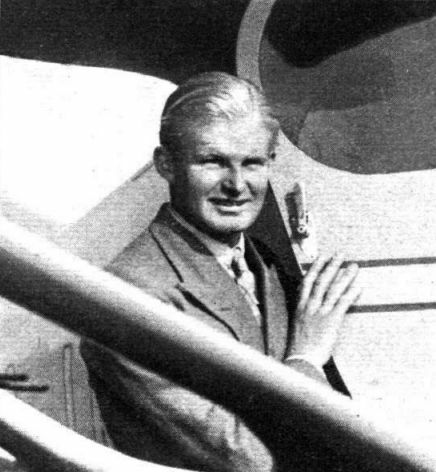 HOMEWARD BOUND: C. J. Melrose, with his Heston Phoenix (Gipsy Six) photographed shortly before leaving for Australia. 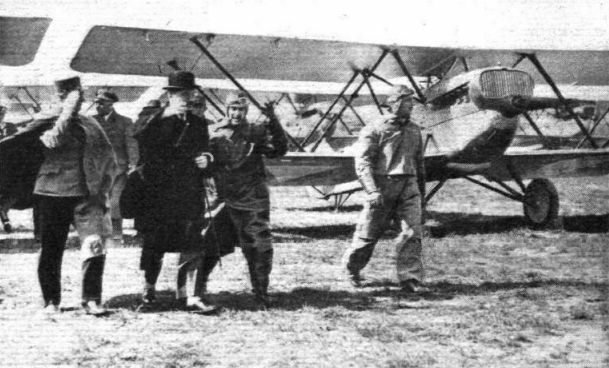 He had an official send-off from Heston last Saturday, Mr. C. F. G. McCann, Agent General for South Australia, and Mr. Pemberton-Billing (who is Mr. Melrose's uncle), being among the well-wishers. The fact that an extremely adverse weather report thereupon caused a postponement came as rather an anti-climax. Actually, Mr. Melrose left on Monday. 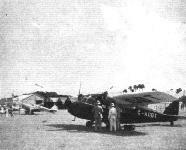 He is proceeding Australiawards in easy stages, and on arrival will use the Phoenix for charter work; he will also represent the makers, the Heston Aircraft.Co. Ltd.
Two doors are provided in the Heston Phoenix and the seating arrangements can be modified according to the use to which the machine is to be put. 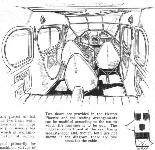 The luggage compartment at the rear has a separate door and, though both are not shown in the diagram, there are two doors for the cabin. 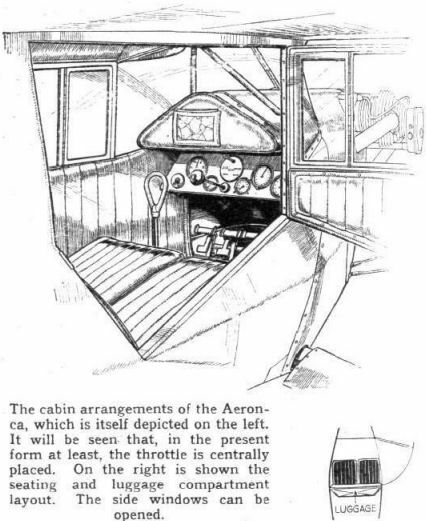 The general arrangement of the surprisingly roomy cabin is apparent in this Flight sketch. The small lever on the left of the pilot's seat (although in this case only one set of controls is fitted, dual controls are optional) operates the split trailing-edge flaps. There is, as will be seen, ample room, and the luggage is stowed in a compartment at the rear of the cabin. The seating plan indicates the very useful width of the two doors. 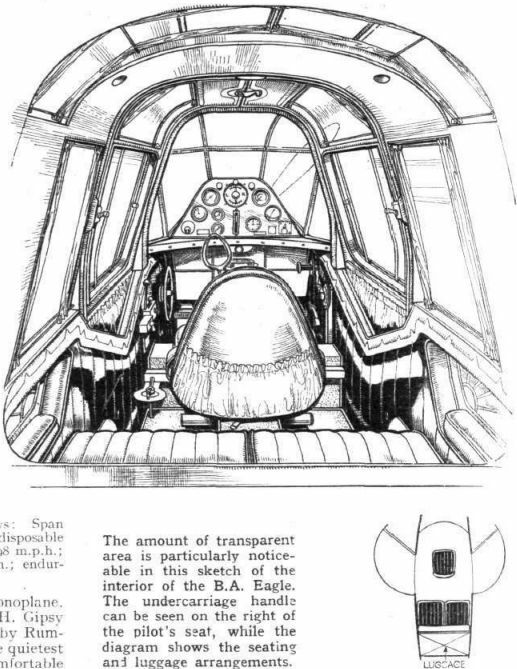 The clean lines and simple design of the Hillson Praga are apparent in this view, which shows also the forward field of view available for the pilot and passenger. 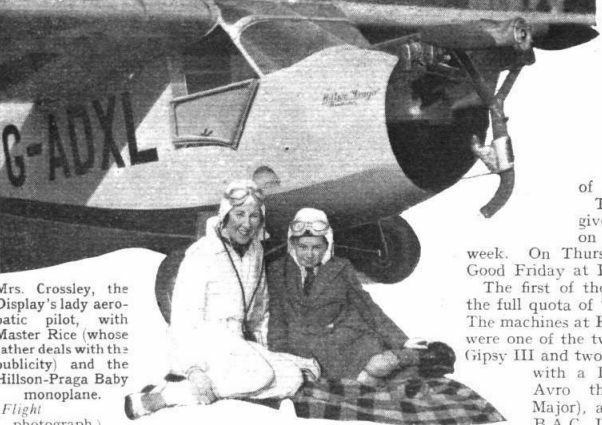 Mrs. Crossley, the Display's lady aerobatic pilot, with Master Rice (whose father deals with the publicity) and the Hillson-Praga Baby monoplane. 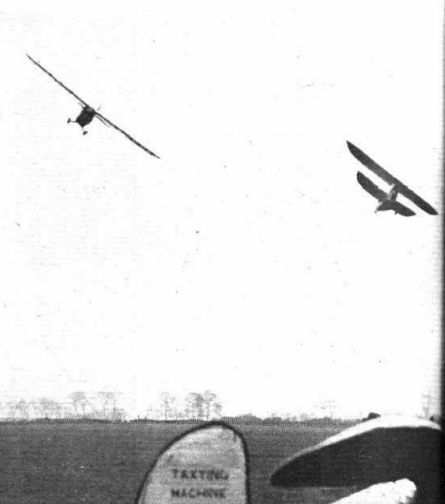 Mr. A. J. Richardson, the 74-year-old enthusiast, put his hands up in surrender when a strange biplane "attacked" his Salmson Klemm as he flew it towards his ground at North Walsham, Norfolk; and the biplane's passenger was armed with a camera. 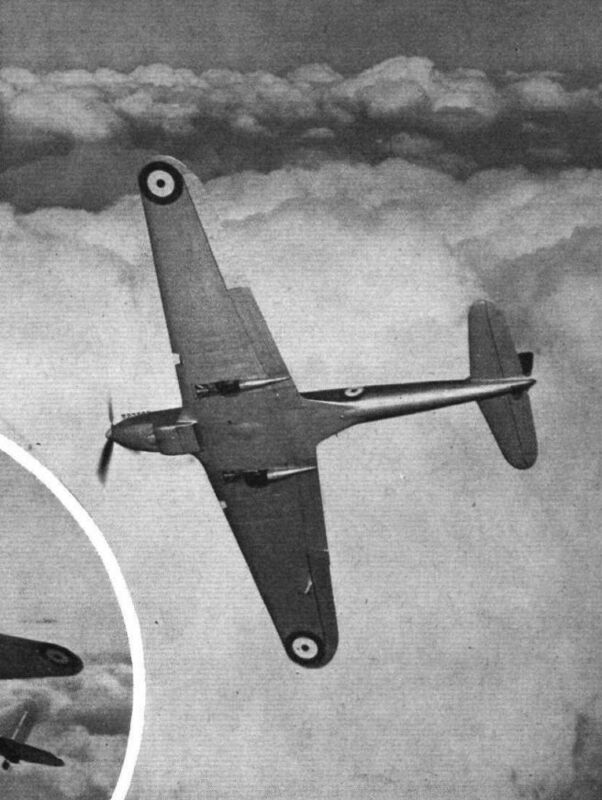 The Beechcraft, though at first glance somewhat odd in appearance, has some excellent features as well as a good performance. 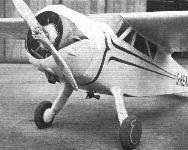 American long-distance racing type: the Bellanca Irish Swoop (Twin Wasp Junior). Fully cowled and pressure-baffled, the installation of the Warner Super-Scarab is extremely interesting. Note the streamline tyres. 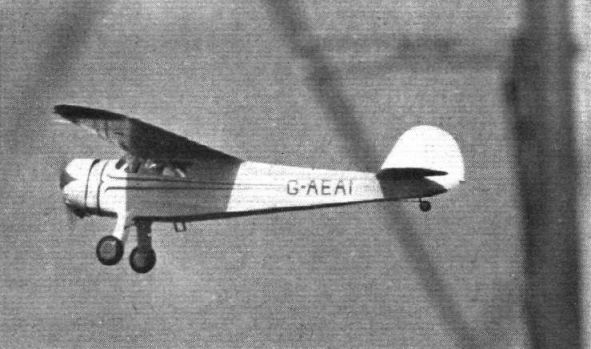 The clean lines of the Cessna are admirably shown in this flying picture taken near Croydon. In this interior view the standard equipment is shown. The small window on the left can be opened. 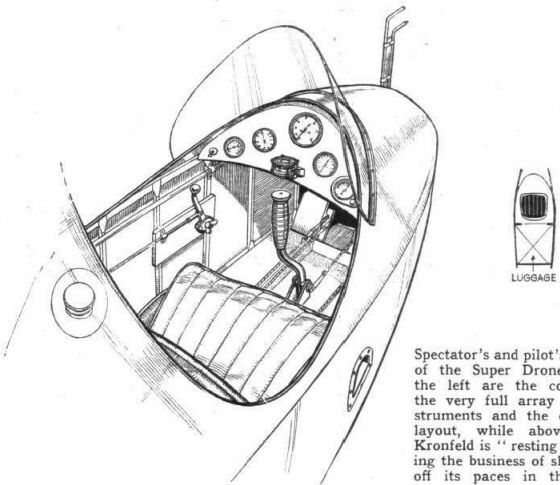 To be examined in conjunction with the interior sketch, this picture shows how the offside seat is slid back for entry to the pilots' seats. The self-centring tail wheel (left) is sprung and damped. 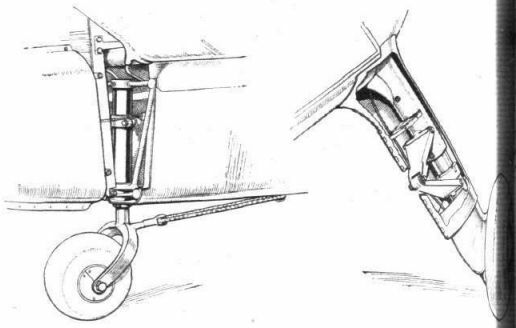 On the right is one of the cantilever undercarriage legs with the fairing cut away to show the means used to prevent the lower portion of the leg from turning in relation to the main body. The latest addition to the Avro range of trainers - the 643, which replaces the Club and standard Cadets. Certain modifications have been made to improve the machine from the tuitional standpoint, and the airframe has been strengthened. 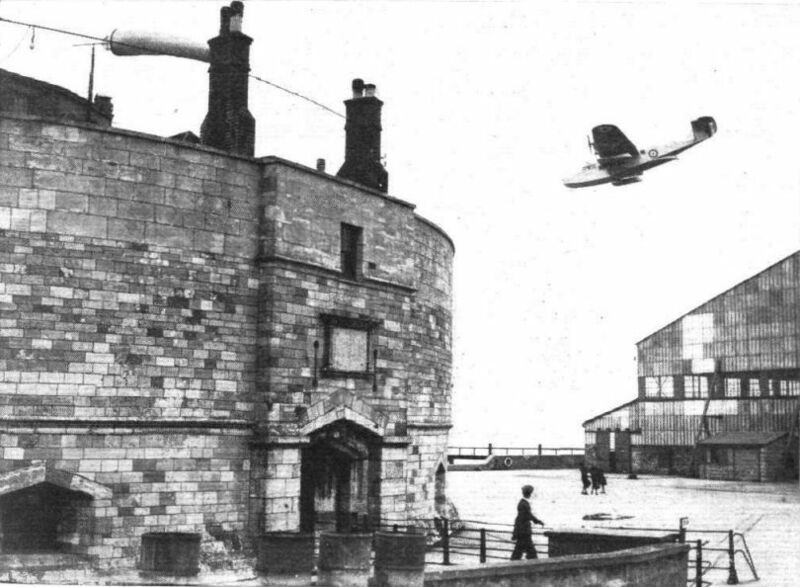 The exterior view shows two of the three generators, a landing light and the short and long-wave aerial systems. 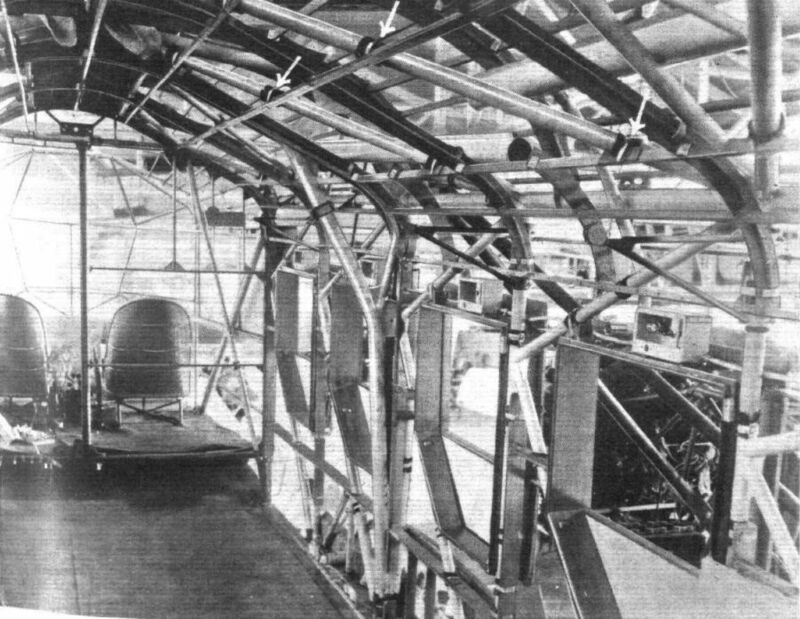 The major part of the equipment of the "Flying Showroom" is arranged immediately behind what is normally the bulkhead of the Dragon. 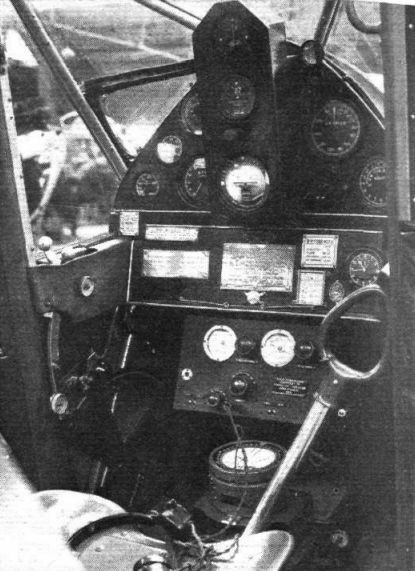 On the left is ths Standard radio compass, while the various details of the other radio equipment are nearer the cockpit. 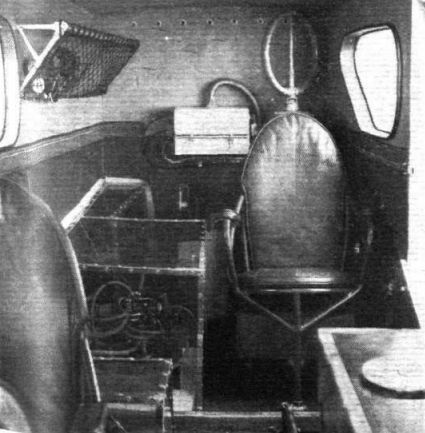 An interior view of the rear of the Dragon's cabin with the automatic pilots for the three axes in their transparent covers and the rotating loop for the radio compass. The Eagle, which, with three occupants and their luggage, cruises at 130 m.p.h. 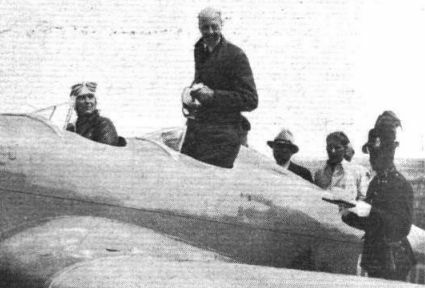 THE ONCE-OVER: Colonel Lindbergh inspects the B.A. 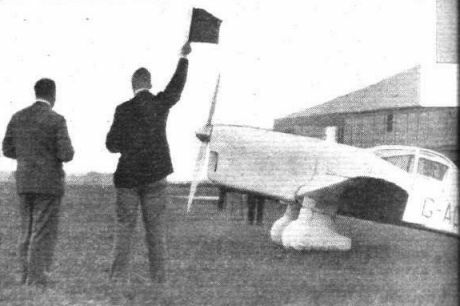 Eagle prior to making his first flight since he came to England. 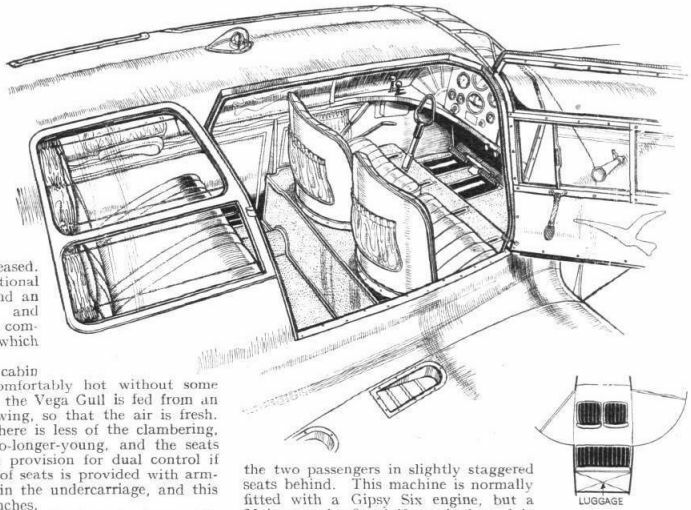 The amount of transparent area is particularly noticeable in this sketch of the interior of the B.A. Eagle. 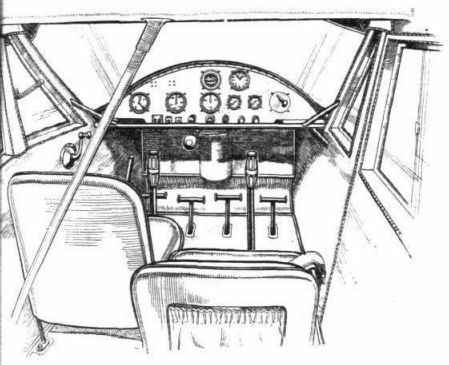 The undercarriage handle can be seen on the right of the pilot's seat, while the diagram shows the seating and luggage arrangements. The modern long-chord cowling is designed in relation to the body behind it. Note in this view of one of Sabena's Savoia Marchettis how the cowling of the fuselage engine increases in diameter toward the rear and how that of the outboard units taper in the opposite sense. 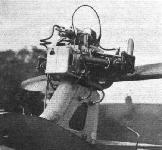 Although not absolutely typical, the instrument layout of Lord Sempill's Puss Moth is interesting. It includes an R.T.E homing receiver, while in the centre panel are the Sperry artificial horizon and directional gyro and the homing indicator. 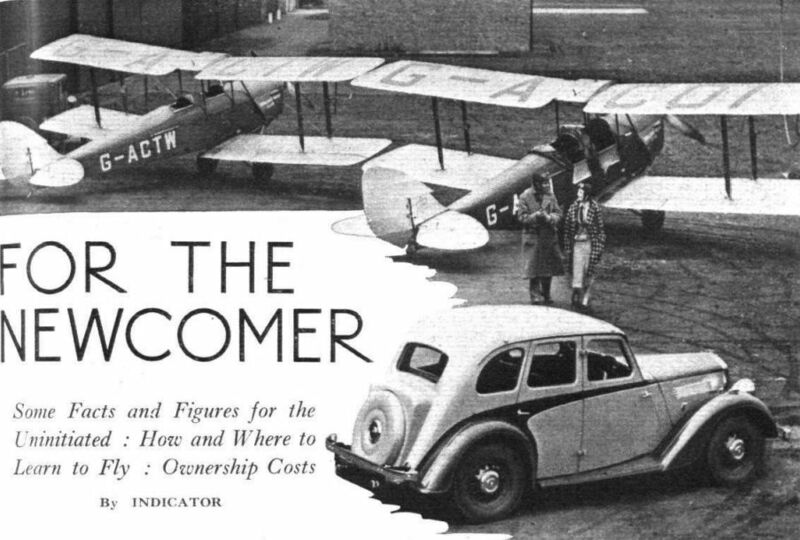 Economical flying is provided by the Light Aircraft Co.'s Aeronca, which carries pilot and passenger on an engine of 40 h.p. only. 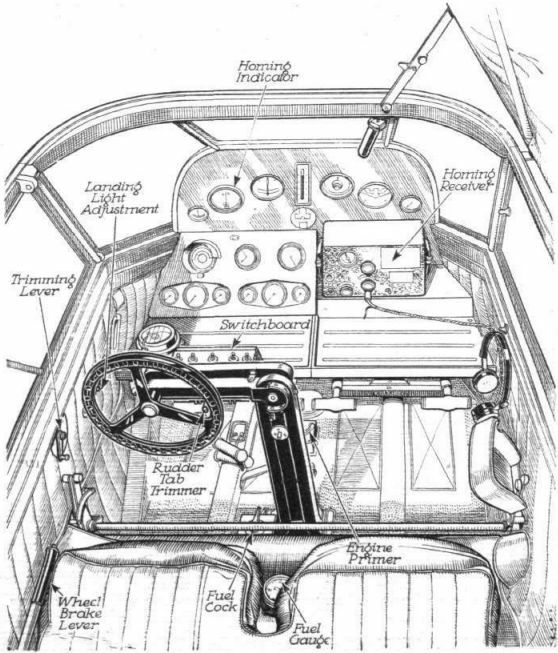 The cabin arrangements of the Aeronca. It will be seen that, in the present form at least, the throttle is centrally placed. 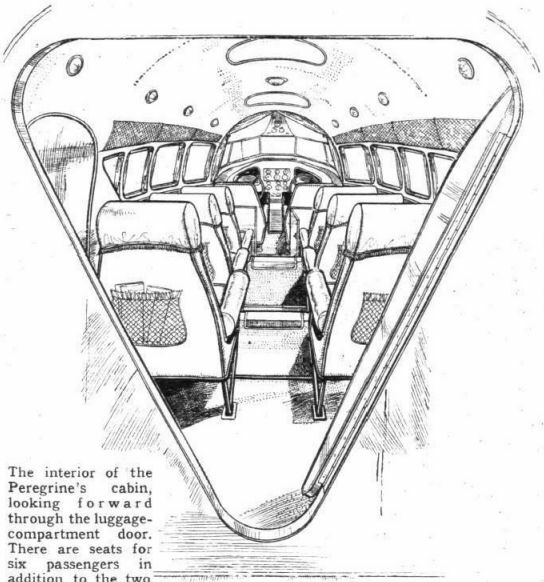 On the right is shown the seating and luggage compartment layout. The side windows can be opened. Perhaps one of the two best-known racing types in this country is the D.H. Comet (two 224 h.p. 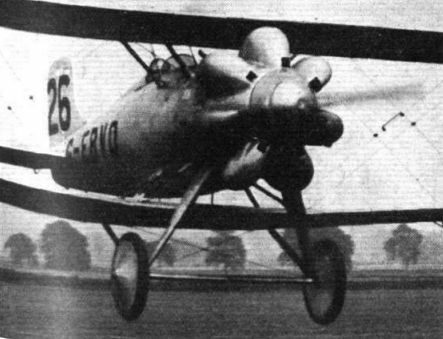 Gipsy Six R). The presence of R.A.F. 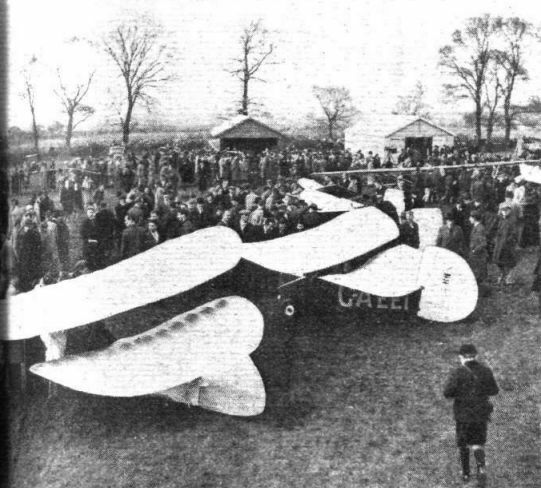 markings on the Comet indicates that the Service can learn from a racing aeroplane. 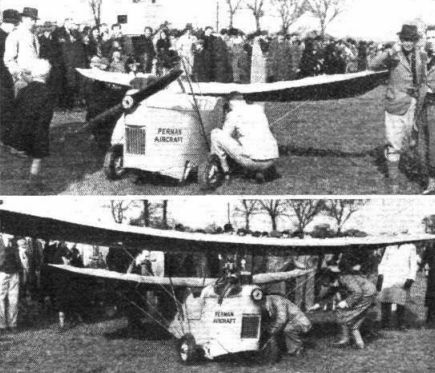 The Fleet: Miss Joan Meakin's Wolf glider, the Airspeed Ferry, and the B.A.C. Drone are in the foreground. Spring in the Air: Capt. King in the act of giving everyone a close-up of the Airspeed Ferry. One of the smart vans attached to the display is in the foreground. 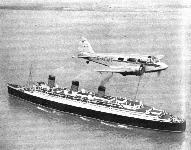 LINERS OF TWO ELEMENTS: This fine aerial picture of the Queen Mary was secured by Flight's photographer over Cowes Roads last week. 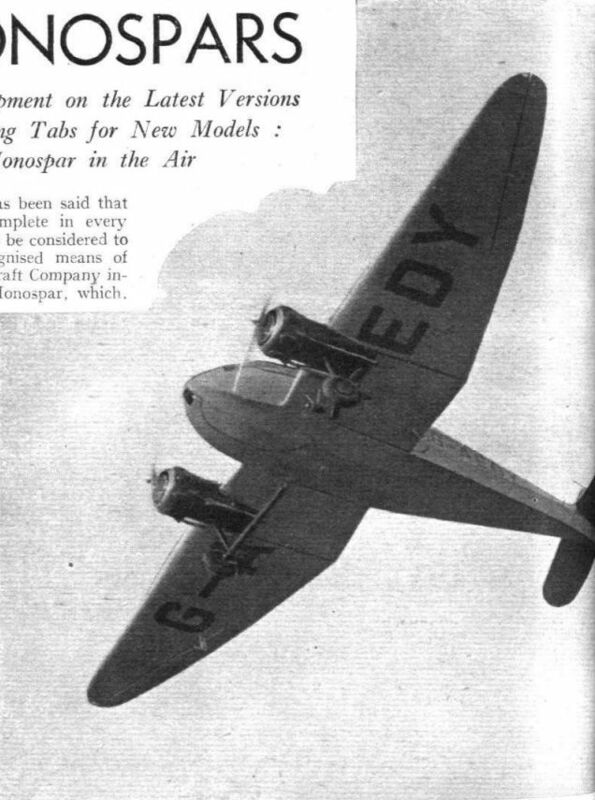 The Series II Envoy - from which, incidentally, the Airspeed Company's joint managing directors, Mes N. S. Norway and A. Hessell Tiltman, were viewing the liner - was flown by Fit. Lt. C. H. A. Colman. 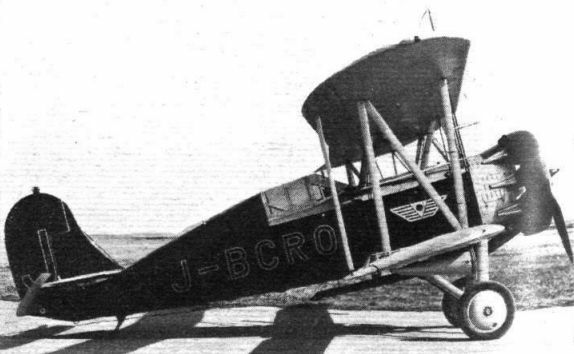 Avro Baby (35 h.p. water-cooled 4 cyl. 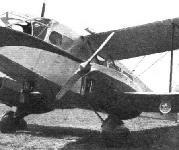 Green), as flown non-stop to Turin by the late Bert Hinkler. "Helmets" gave a good aerodynamic improvement, but bad cooling. 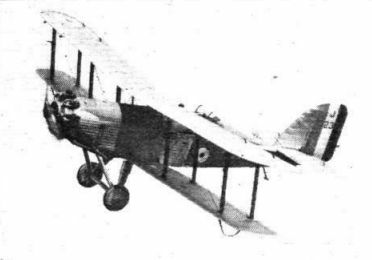 The Lynx-engined Blackburn Lincock was one type equipped experimentally. 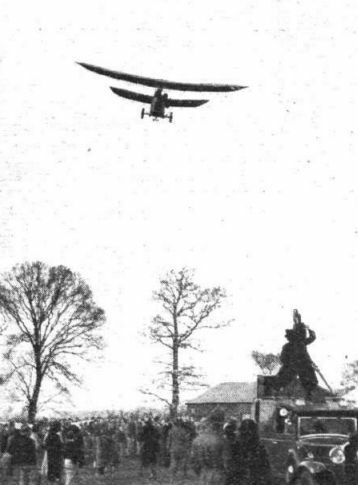 ELIMINATING TRIALS AT LYMPNE: 5, Longton planting the Blackburn "Bluebird" in the landing test. An impressive flying picture of the first of the three Martin boats designed for long-distance transoceanic work - the China Clipper. The "teardrop" fuselage of one of the famous Hornet-powered Gee Bees shows up well in this view. 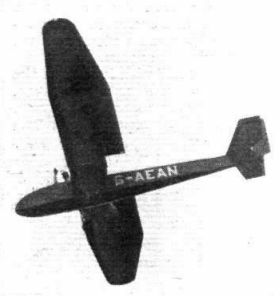 The English Electric Company's Wren, which flew strongly on the power of a 400 c.c. A.B.C. motor cycle engine. INDIA'S MODEL AIRPORT BUILDING: This aerial picture, taken by Indian Air Survey and Transport, clearly shows the design of the New Delhi airport building, which was opened by H.E. Lord Willingdon on February 15. It is particularly interesting since it will be the model for several others which are to be built in India and forms a concrete result ot travels of Mr. R. T. Russel and Capt. A. G. Wyatt, who were responsible for the design. 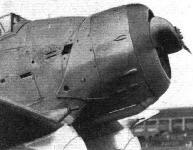 The D.H. 53 (750 c.c. 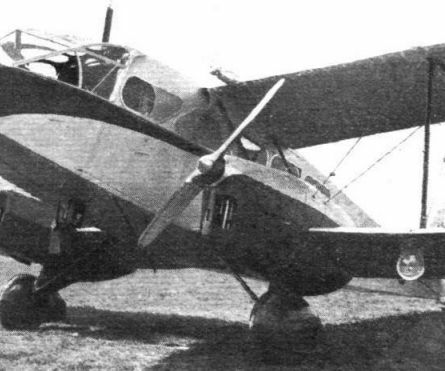 flat-twin Douglas). 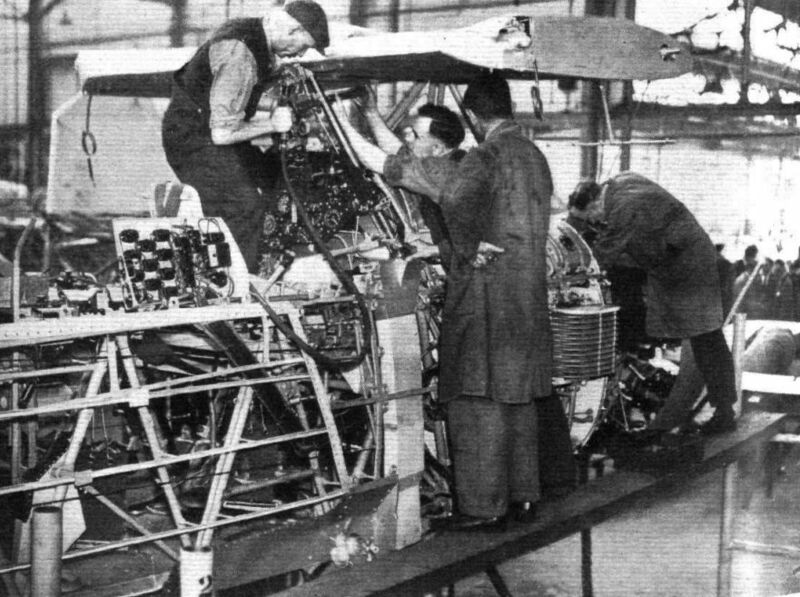 A two-seater cabin machine now in the process of being built - the Marendaz, which is likely to be fitted with a Pobjoy engine. 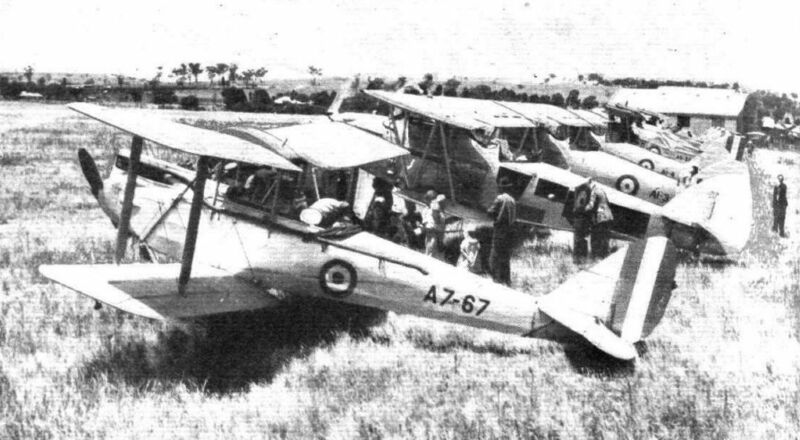 Competing machines in the Viceroy's Cup Race lined up on the aerodrome at Bombay. The Scion is fifth in the line. The machine being refuelled at Bombay during the race. H.H. The Maharajah of Jodhpur trying out the Scion with his personal pilot, Fit. 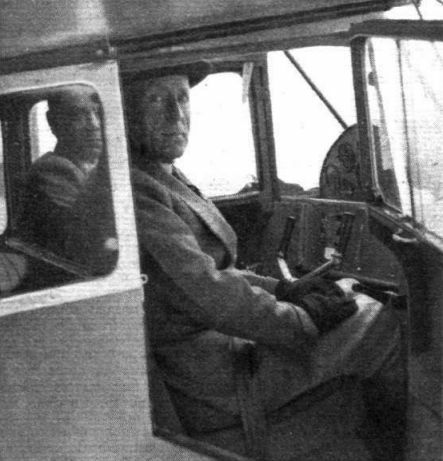 Lt. Godwin, at the controls. 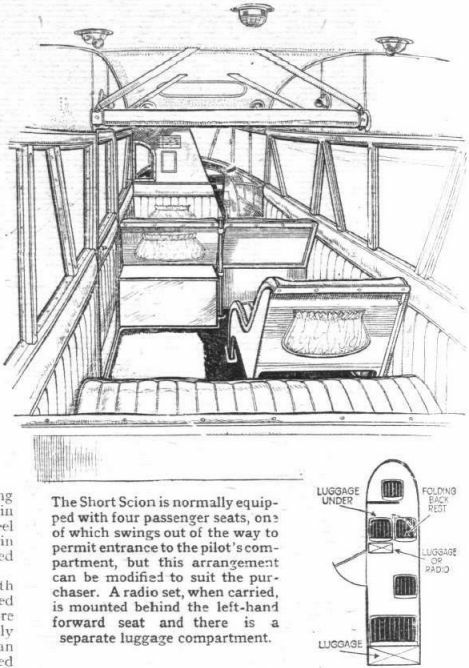 The Short Scion is normally equipped with four passenger seats, one of which swings out of the way to permit entrance to the pilot' s compartment, but this arrangement can be modified to suit the purchaser. A radio set, when carried, is mounted behind the left-hand forward seat and there is a separate luggage compartment. BACK TO THE LAND: The Boeing 299 makes a finely judged aerodrome approach over a maize field. The interior of the Peregrine's cabin, looking forward through the luggage compartment door. 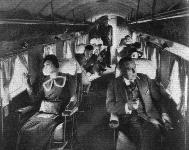 There are seats for six passengers in addition to the two pilots. "- nothing up my sleeve." Mr. Idwal Jones demonstrates the docility of the B. A. C. Drone. The 750 c.c. 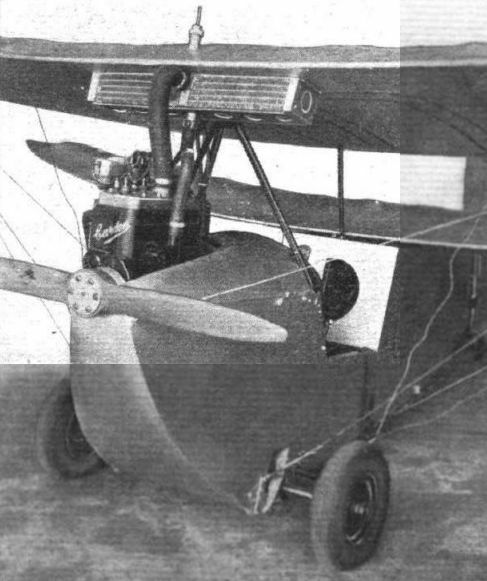 Douglas engine of the type used in the Drone. 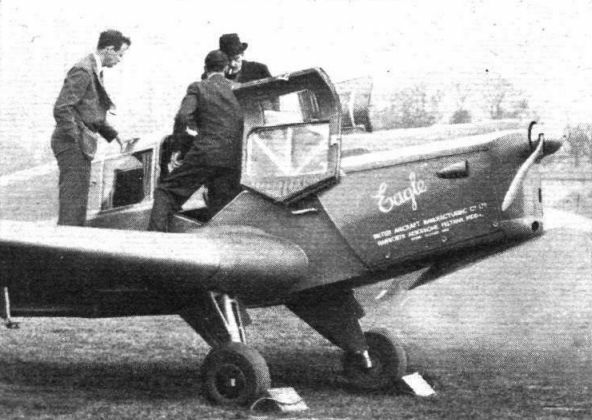 PROOF: Lord Sempill's flight to Berlin (11 hours) and back (9 hours) in a B.A.C. Super Drone must have given a jolt to those who habitually scoff at ultra-light aircraft. 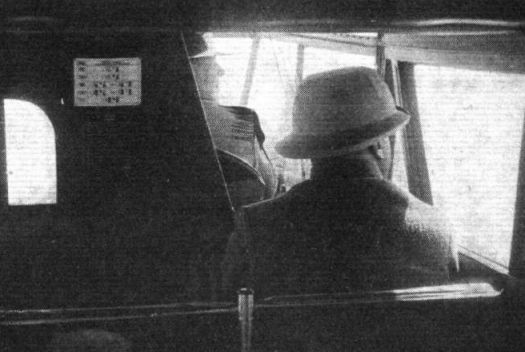 Lord Sempill is seen at Croydon with Mr. Kronfeld (right). Pilot's view of the Super Drone. 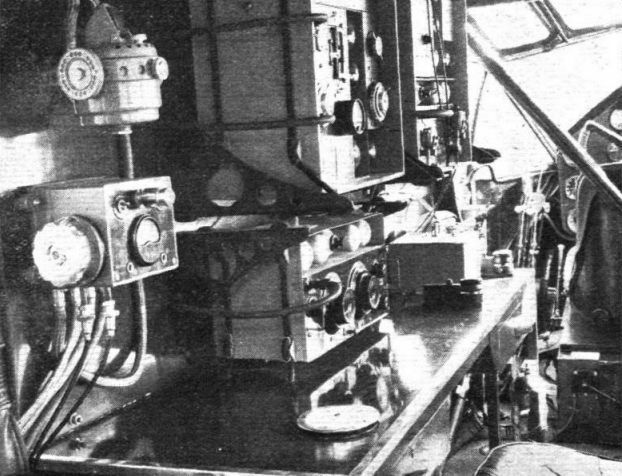 On the left are the controls, the very full array of instruments and the cockpit layout. 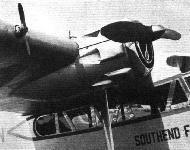 Typical type used by the Royal Australian Air Force: Supermarine Southampton (wooden construction). [Nakajima P-1] JAPANESE - WITH A TWANG: This Nakajima biplane carries the night mail between Tokyo and Osaka. Its cruising speed is about 120 m.p.h. Mr. "Jimmy" Haizlip with one of the successful Travel Air "R" monoplanes of a few years back. One was seen over here in the hands of Capt. Frank Hawks. The Swallow has an enviable reputation for safe and easy handling. "Helmets" gave a good aerodynamic improvement, but bad cooling. 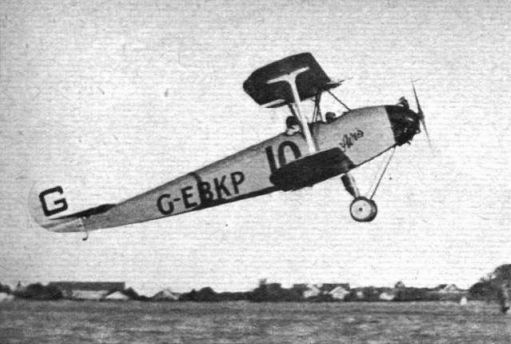 The Short Crusader racing seaplane had its Bristol Mercury similarly cowled. Only one "helmet" is shown in place here. 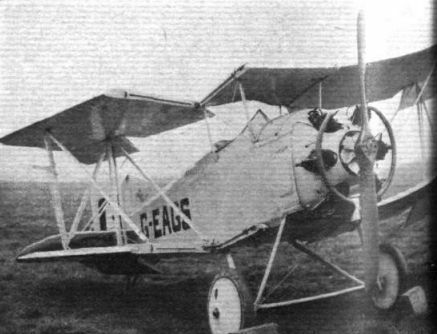 The Wedell-Williams was a favourite mount of Colonel Roscoe Turner, among others. This can be seen what lay beneath the cowling of the Hornet engine of a Wedell-Williams racer a few years back. 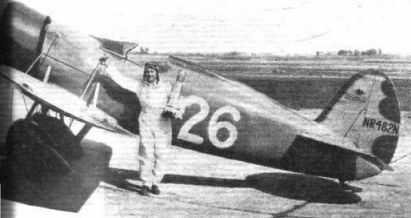 Roy Minor with Miss Los Angeles, the successful Brown monoplane. 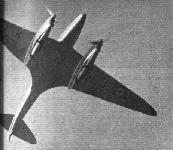 A somewhat unusual cowling was fitted to the Mercury engine of the Bristol 133 fighter. 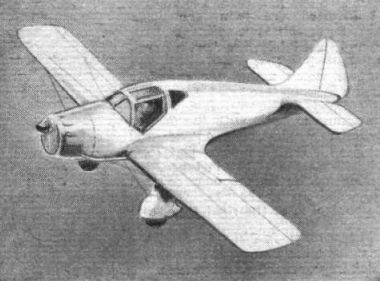 SIMPLIFIED FLYING: Another interesting American result of Mr. Vidal's compaign for simpler aeroplanes - the Campbell and the all-metal pusher monoplane which, with a Ford V8 engine, has a cruising speed of 100 m.p.h. 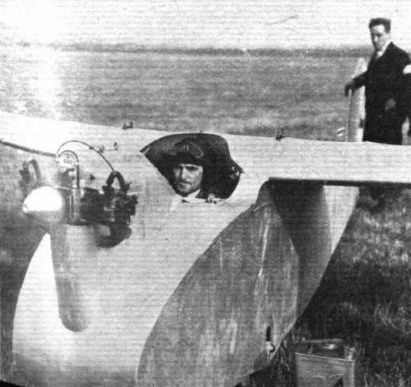 As in the case of the Weick and the Hammond, the machine has a three-wheeled undercarriage, and that there is a very good field of view in the "two place" cabin can be gathered from this Shell Aviation photograph. Note the radiator intake. 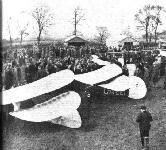 The Laird biplanes achieved no little success in America a few years ago. 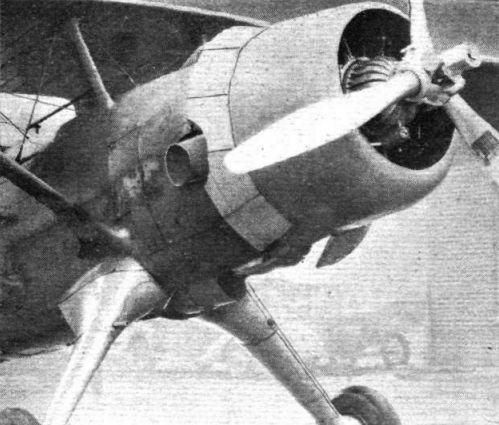 This Wasp-powered model broke the continental record in 1931. 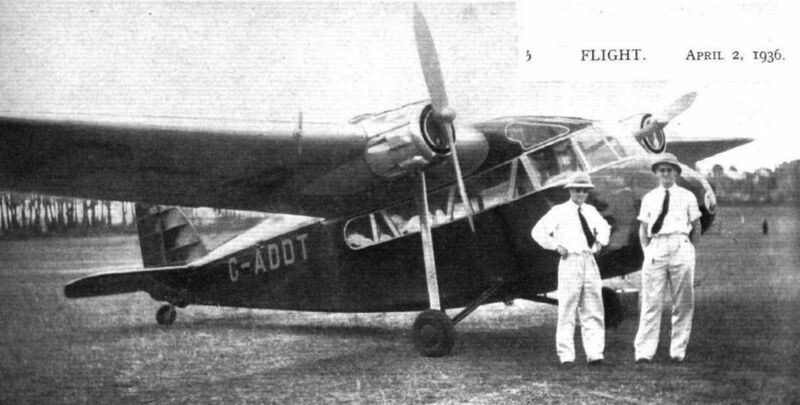 DUPLICATED: Latest of the British Aircraft Manufacturing Company's developments, the Double Eagle is eventually likely to be of considerable interest to the smaller air line or charter operator. 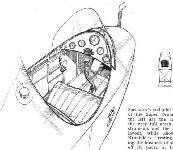 The pilot has a very good view in all essential directions and, with the low-middle-wing arrangement, the passengers, too, will be able to take an interest in earthly matters. The engines are Gipsy Majors. A scale model of the Pemberton Billing Skylark's "skeleton." All joints are welded.